You came to University to develop your ideas. So it is worthwhile thinking about what an idea is. The word idea has always referred to something in the mind. Apart from that, however, theorists have used it very differently. Locke uses idea for anything we find in our mind. But he argues that all ideas come, originally from outside our minds, from experience. (He is an empiricist). Locke thinks we can be confident about ideas because they are rooted in external reality. But how do we distinguish false ideas from true ones? Locke does this by dividing ideas into simple and complex. The simple (e.g. blue) are always true, because they are straightforward copies of experience. The complex, however, are made up of simple ones, and it is possible to arrange them mentally in a way that they are not arranged outside the mind (e.g blue oranges). This, he thinks, is how false ideas are created - through imagination. For Locke, science, the search for true ideas, consists in checking our ideas against experience to see if their parts are arranged in the same way outside our minds as they are inside. Hume separates the contents of the mind into two, ideas and impressions. Impressions are the vigorous imprint of external reality upon us, ideas are the weaker images of the impressions that persist after the outside reality has gone. It is these weaker images that we use for remembering, reasoning and imagination. There is an important difference between ideas and impressions, that was pointed out by the Greek philosopher Plato. All impressions are individual. It is this orange, or that orange that we have an impression of. The idea of an orange, however, is general, or universal. The idea orange applies to all oranges. From Plato's point of view, it is the idea of an orange that allows us to see an orange. Imagine two objects before you. How do you know which, if either, is an orange? Plato says that you compare the objects before you with your idea of what an orange should be. If one of objects before you fits your idea, you say that is an orange. But, imagine that the object you have called an orange is deformed. It has grown with a strange shape. What tells you that this is a deformity? Once again, you compare it to an idea of what an orange should be like. This is an ideal or perfect idea of an orange. Comparing the ideal with the actual orange shows you that the actual orange is not a perfect orange. But now someone takes you to an orange market and asks you to find a perfect orange. There are thousands of oranges, and many look nearly perfect. But everyone you look closely at, differs in some respect from the perfect one. So where is this perfect orange that you are comparing the actual oranges with? It is your idea of an orange. So the idea, for Plato, is not a result of the impressions, it is what enables us to understand the impressions. Dictionaries will sometimes indicate that different theorists have different definitions of a word. Chambers Dictionary, for example, gives a definition of idea that fits Locke and Hume, and definitions for Plato, Kant and Hegel. Usually, however, general dictionaries concentrate on definitions that explain common usage of words. Webster's Dictionary carries this further than most. It provides lists of words with similar meanings ( synonyms ) and explains how their common usage differs. impression also implies vagueness of an idea provoked by some external stimulus (I have the impression that she is unhappy). abstract ideas are very general ideas and theories. They are general ideas drawn out of specific or concrete things. You are a specific and concrete person. The idea human being is an abstract idea. The idea species is an even more abstract idea. Concrete: means something solid, with substance. It is the opposite of abstract. Specific means a particular thing or person. It is the opposite of general. In any area there will be degrees of each. For example, if you are talking about your skills it would be very abstract and general to say you are a skilful person. It would be more concrete and specific to say you have good communication skills. It would be even more concrete and specific to say that you speak fluently in English, speak a little French and know a smattering of phrases in other languages. Thought is full of things that represent other things. There are many words to describe this thinking by comparison. These words include analogy, metaphor, simile, allegory or parable and symbol. Hobbes argued that the beginning of rational thought is to create marks, signs or symbols to represent things we experience, and that the beginning of society is when we use the same symbols (words) for the same things. The symbol of something represents it, but it does not have to be like it. When you make an analogy between two things you show that they are alike in some way. Sociologists are making an analogy when they explain the functions of society by comparing them to the organs of a human body. Psychologists are making an analogy when they explain mental processes by comparison with the processes of a computer. Similes, metaphors, allegories and parables are also ways of describing something by saying it is like something else. If your tutor works you hard you may say she is like a slave driver. That is a simile. It is a metaphor if you say she is a slave driver. The study of the systems of symbols that we use in language (words) and in logic is called Semantics, which just means the study of signs. (A semantic issue is one concerning the use of words rather than reality). However, there are many other systems of signs and symbols, such as gestures, music, drawing and dress. The study of systems of signs and symbols in this broad sense is called Semiotics, which also means the study of signs. Semiology also means the study of signs, and can be used as an alternative to semiotics. The word semiotics was coined by an American, C.S. Pierce, and semiology by Ferdinand de Saussure, so they are sometimes used to indicate the two authors' different systems. Our society and culture (which includes language) has been described by Herbert Blumer as providing us with a "fixed sets of symbols which people use in interpreting their situations". (Blumer 1969, p. 88). Analysis, analyse and analytic are words that refer to releasing the meaning of something by breaking it down (mentally or physically) into parts. The opposite of analysis is synthesis, which means putting separate items together to make a whole. Careful thought often depends on mentally breaking issues down into parts and thinking about how the parts relate to one another (the structure of the whole). Analysis is, therefore, used for considering something carefully to understand it fully or to explain it, as in "analysing the causes of crime". A synthesis is a close integration or combination. Apperception means interpreting new ideas or impressions by the help of past experiences. It was a buzz word in 1899, when William James wrote Talks to Teachers on Psychology. Apperception, James said, is a long word for something we are already familiar with. As it is explained, we recognise it as the way that we receive impressions into our minds. "in some determinate direction or other, making connection with the other materials already there". ( James, W. 1899 p.77). Every impression falls into a mind preoccupied with memories, ideas, and interests. Every impression reminds us of something. Things already in the mind link with the impression so that something new is born and we conceive the impression in some definite way. The mind assimilating the impression forms a new field of consciousness, of which one part (and often a very small part) comes from the outer world, and another part (sometimes by far the largest) comes from the previous contents of the mind ( James, W. 1899 p.77). A simple example is ABC. Our mind probably assimilates this impression to the pattern ABCDEFGHI etc. If we see the same signs in another order: CAB, we probably do not think of the alphabet. One person might think "Taxi", but someone else might think "Citizens' Advice Bureau". William James argues that the way we deal with the impressions that enter our minds will depend on "our acquired possibilities in the way of ideas" (our education). So, at the end of your degree, you should be able to look at things in a more varied and better structured way than you do at present, because you should have more conceptions, more systematically related to one another, than when you started. But, whatever our education, we have a mass of apperceptions waiting in our minds to receive and assimilate impressions. Writers like Julie Ford refer to these as Common Sense Theories. She thinks that our common sense theories are ways we interpret reality, and that they are analogous to the ways that science uses, and to the ways used by such other systems of academic thought as philosophy and theology. Latin "for from what is before". The phrase "a priori reasoning" was used from the sixteenth century to describe reasoning from causes to effects deductively. It acquired (19th century?) the meaning of knowledge or concepts not derived from sensory experience: knowledge that we have before the facts. For example, to count 3 rabbits you need to know that 1 + 1 + 1 = 3. You cannot find this out from looking at the rabbits. You need to know it a prior (before). Latin "for from what comes after". Used, from the early seventeenth century for reasoning from effects to causes; inductively or empirically. Thought of as the opposite process to a priori reasoning. Analytic propositions: In these the truth is a logical property of what is said. For example "this cat is an animal" is true because we classify cats as animals. Analytic propositions do not add to our knowledge of the world except in as far as they tell us how things are classified by our culture. Synthetic propositions: A synthetic proposition contains extra knowledge. "This cat is black" tells us something that is not a necessary property of being a cat. It is a synthetic proposition because we combine (synthesise) our thinking with an empirical observation. "1 + 1 + 1 = 3" is an a priori synthetic proposition. It is not based on observation, but it tells us something about the world. It is knowledge that we derive from reason. Axioms are the starting points of an argument, deduction or theory that, by definition, are not proved by the theory. Axiom is another word for premise. An idea that relates to a class of objects is a concept. The idea "London" is not a concept as it refers to a specific place. The idea "city" is a concept because it covers everything in the class "cities". Theories are composed of relationships between concepts. The concept suggests to us how we should view things that we classify under it. (As with Andrew Roberts being a person). Although theories (constructed from concepts) may be empirically testable, concepts are not. A concept is a mental construct used to sort the world out. Much of a science consists of constructing appropriate concepts, and dictionaries of a science consist largely of descriptions of the concepts it uses. In a Dictionary of Sociology, for example, you would expect to find descriptions of concepts like class and society. In arithmetic, one is a concept. One teddy bear is a particular. 4 x 4 = 16 is part of a conceptual system. Sixteen teddy bears is a particular problem for the toy cupboard. Some philosophers argue that the conceptual system was derived by induction from multitudes of the particulars, others that the idea or concept comes before the particulars (see reason). If mathematical systems were stimulated by handling the material world, it seems to me that it was a conception of creative imagination rather than a process of mechanical induction. Emile Durkheim argues that the creative imagination is collective. To be conscious is to be alive, awake and aware of things. The things we are aware of our immediate perceptions - by sight, touch, hearing, taste, pain, inner feeling, etc..
Intuition means looking at. We intuit our perceptions without recourse to reason (inference). The more popular meaning of intuition excludes things we perceive as well as things we infer. When people say "it is just an intuition" they probably mean that it is just something they feel is true, without any evidence. Clear thinking and clear speaking and writing support one another. An ambiguous statement is one that is unclear because it has a double meaning. Sometimes there are two contradictory meanings. In the following passage, the writer begins with a clear and original explanation of the empiricist theory of knowledge. But then the phrase "steer well clear" (avoid) comes in, and the reader is no longer clear. The passage becomes ambiguous. This may be just because the writing is confused or also because the writer's thinking is confused. Should we avoid our senses or rely on them? "Our knowledge should be based on our own experiences. We should not rely on our friend's opinion to tell if we love someone. We should trust our own experience. In the same way, we should relate our knowledge to our own senses. We should steer well clear of sense data to make sure it has not been rearranged by fantasy and passion." Clarifying ambiguous writing helps us to think clearly. Many academics will say that universities are especially concerned with developing critical thought. Not many academics, I find, will explain what they mean, and the explanations I have been given show that people mean many different things by critical thought. "Criticism is being aware of the limitations of numbers, criticising or challenging the meaning of statistics within a specific context." Compare this with the idea of critical thinking in reading and writing which is concerned with evaluating strengths, as much as weaknesses, and with interpretation as much as with evaluation. Critical analysis combines critical, in the sense of evaluating, with analysis, breaking down into parts. So a critical analysis of an issue or an argument would evaluate it by examining its parts and how they relate to each other. A deduction is an argument or theory starting with axioms or premises and leading to a conclusion. The argument or theory explains the conclusion. Deduction is used in essays, but not usually in the formal way that it is when setting out a scientific theory. An example of an essay that does use deduction this way is James Mill's Essay on Government (1820), discussed in Social Science History chapter one. John Stuart Mill contrasted deductive logic, the established rules of reasoning dating back to ancient Greeks like Aristotle , with inductive logic, the rules by which one makes legitimate inferences from empirical data. Both, he said, are necessary for science. Deductive reasoning is used to create theories and testable hypotheses for empirical research. In natural science, these deductions will link universal laws of nature to statements ( propositions) about things that need explaining. In a paper published in 1948, Carl Hempel and Paul Oppenheim argue that a form of argument they call deductive-nomological explanations can be used to link universal laws to statements - in way that can either explain or predict. If the explanation predicts, it can be used to test the laws. Deductive-nomological explanations show deductively that the thing to be explained comes under certain general laws. Nomos is a Greek word for law. 2) Conditions (statements which make assertions about relevant facts): These lead on to the Explanandum Sentences about the thing to be explained. General Law: The volume of a given quantity of any gas will reduce in line with the pressure that it is under. Conditions: An experiment that puts pressure on a quantity of gas. Explanandum: The volume of the gas decreases at the same rate that the pressure it is under increases. Thinking is a social activity as well as a private one. The public and private aspects of thought support one another. Dialogue is the exchange of ideas between two or more people, and the development of the ideas that results. Other words with a similar meaning are argument, conversation, debate, dialectic, discourse, discussion and talk. Socrates, one of the founders of European thought, used dialogue as his method of reasoning. His dialogues with friends are recorded in the work of his pupil, Plato. These books are often called "Plato's dialogues". Peter Medway argues that dialogue is one of the most important means for developing new ideas. A good university and any creative environment has networks of communication for everyone through which dialogue buzzes backwards and forwards like an alternating electric current. Ideas are represented by symbols (often words) which we use to communicate the ideas. Using symbols we work on ideas through networks of communication with other people, as well as with books, television the world wide web and other media. As we do so, we not only exchange ideas and hear ones we had not heard before, we also create new ideas, adapt ideas to our own uses, join ideas together in creative ways and change them in other ways, test the ideas and find that some are worth keeping, whilst rejecting others. A good university is rich in structures that encourage this ferment of ideas. Creative networks can be thought of as both the chains of ideas passing between minds and as the structures that facilitate this interchange of ideas. The richness of the dialogue about ideas that precedes a student assignment should be reflected in the quality of his or her essay, exam answer, report, demonstration or other project. Dogma is a theological term for doctrines that a church says are true and ought to be believed. In this way, a church provides a written foundation of faith for its members. Dogma is used today for rigid statements of beliefs. Dogmatic is used for beliefs stated assertively without providing or allowing for reasons. To be dogmatic in this sense: state your beliefs without evidence or reason, as something that must be believed because you say so. (You will not get very good marks). To avoid being dogmatic, explain the reasons, and give evidence, for what you believe. The basic principles used for reasoning are axioms rather than dogmas. That is they are considered as foundations of argument rather than unquestionable statements of belief. Different theories may have different axioms and it helps develop our thinking when we work out what axioms we are using. Empiricism is the theory that [all scientific] knowledge is based on experience. An empiricist is one who holds such a theory. observation: watching carefully. In the middle ages the word was used mainly used for observing (obeying) laws carefully. Then it was applied to watching carefully for signs or omens that might indicate good or bad fortune. Only in the sixteenth century was the word used with its empirical meaning of examining the things we can sense (see, hear, touch, feel, smell) carefully and methodically, and taking note of them, with the intention of drawing scientific conclusions. Gerry Rose in Deciphering Sociological Research (p.306) defines empirical research as any research involving the collection of new data. He distinguishes it from library research, which he does not define. Empirical research is a subject (often the main one) studied on "Research Methods" courses. It studies the different ways in which theory can be linked to empirical evidence. Gerry Rose suggests that the two basic ways are through "theory testing", when empirical evidence is used to test a theory; and "theory construction", when the empirical evidence is used to help construct new theories. This work is necessary because general academic theories are not, in themselves, testable. We have to produce from them testable theories that, we can argue, are implied by the general theory. Researchers often speak of the general theory as just "the theory" and the testable theories as the "hypotheses". Even then, an hypothesis is only testable when you produce indicators to link its concepts to your observations. 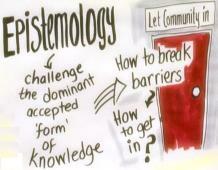 Epistemology is the study of knowledge. (episteme being Greek for knowledge, and ology Greek for study). See under metaphysics for how it relates to other branches of philosophy. The methodology used in research should relate to its epistemology. For example, Diane Rose (21.11.2006 and 2009) argues for research developed from people's experiences. Her philosophy of knowledge claims that lived experience is a source of knowledge. Someone who has suffered a bereavement, for example, could be considered an expert by their experience. Engage Visually drew this picture to summarise a discussion about epistemology Such a theory of knowledge (epistemology) will use methods that seek examine what people think and feel about what happens to them. It will be concerned with their subjectivity. To investigate how people think and feel it may tend to use qualitative methods. It will also, some argue, be more related to the community and less to detached experts. There is a hierarchy of power, Diana Rose argues, that puts objectivity at the top of the epistemology tree. What she calls mainstream research not only favours quantitative methods, but often disparges qualitative as unscientific. In a court of law, the evidence is the material brought forward to support the case or argument. It could include witness statements, documents and objects such as the gun found at the scene of the crime. In an essay, the evidence is the material that supports the argument of the essay. The body of the essay develops in depth the issues summarised in the introduction. This more substantial content can be regarded as evidence for the briefer statements in the introduction. A useful editing technique is to carefully compare introductions to the essay body to see to what extent the introduction states the case that is being made in the body, and to what extent the body supports what has been stated in the introduction. The referencing is almost always an important part of an essays evidence. Quotations can be important evidence. Some essays will require quantitative or other data as evidence. To explain is to make plain, clear or intelligible, as in "to explain how a machine operates" or "to explain the structure of matter". An explanation answers a question beginning with a word like why? or how? Explanations are important in essay writing and in science. If you try to explain something, you will almost certainly find your explanation is a theory of sorts. For example "Why do you go to work?" could be answered by "Because I need the money" - Which implies the theory that you work for money and would not work if you are not paid. Your employer could test this theory by refusing to pay you. A scientific theory tries to explain the world. Some authors, like John Stuart Mill, argue that society and individuals can be explained in the same way that we explain the natural world. Others, like Max Weber, argue that we need a different type of explanation in social sciences to that used in natural sciences. The natural sciences may seek to explain something by relating it to a law of nature. 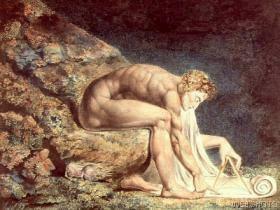 The scientist will produce a theory that proposes a causal link between the law of nature and what is to be explained. John Stuart Mill argued that similar laws might be found to govern human and social behaviour. Psychology laboratories set up by the German psychologist Wilhelm Wundt were an attempt to discover this kind of law. Wundt's work was extended into sociology by Emile Durkheim. Max Weber argued that some regularities in human behaviour have a different cause to those in other parts of nature because they are due to conscious understanding, meaning and purpose. A shower of meteorites descending from the sky does so under the impetus of unconscious forces, a shower of students descending on a lecture does so with conscious purpose. (One of Mill's arguments was that both types of shower are about equally reliable or unreliable.) An explanation in the human sciences can be relating external actions and results to subjective meanings. This does not mean that the explanation of everything social is that human beings intended it. Intentions of people may cause results that were not intended. Weber's best known example of this was the influence of protestant religion on the development of capitalism. Durkheim, however, tried to show that some social events have causes quite distinct from the subjective meanings attached to them. His best known example is the influence of social factors on the suicide rate. In an explanation, the thing that is to be explained is called the explanandum. The statements that explain it are called the explans. This kind of language is only usually used for explanations set out in a formal way to make them testable. (See deductive-nomological explanations ). If you try to falsify a theory you test it by using empirical data to try to disprove it. See verification. hypothesis hypotheses: tentative or unproved theories. Different theories of science adopt different attitudes to their theories. Verificationists, for example, might have a scale of certainty from tentative hypotheses to verified laws (see Webster's words, below). On the other hand, falsificationists could be said to treat all good scientific theories as hypotheses trying to be proved wrong. Julie Ford calls scientific theories fairy tales, and believes that science needs good story-tellers to make its hypotheses. Our creative mental faculty is called imagination. It is the ability to dream up ideas of one's own and ability to create in your own mind an interpretation of other people's ideas. "The powers requisite for the production of poetry are, first, those of observation and description ... secondly, sensibility." "One Power alone makes a Poet: Imagination, The Divine Vision." Existentialist thinkers who follow Sartre and DeBeauvoir, argue that a human being has to create or imagine him or herself. They say we exist in a state of anxiety about what we are and are condemned, by this circumstance, to create our image of ourselves and our relationship to the world around. The words creative, critical and reflective are often used in association with one another. Creative thinking is about generating or creating ideas, or objects. It is related to originality. Some people use spidergrams to capture their creative thoughts. Critical thinking is about the evaluation, interpretation and explanation of ideas. Reflection is looking back at your own thoughts and activities, or what you have read, seen or otherwise experienced, and thinking creatively about what you have thought, done, and experienced. This word means folded together. Examining the implications of something would mean looking at what is involved in it, or what its consequences might be. "we must consider what state all men are naturally in, and that is, a state of perfect freedom to order their actions, and dispose of their possessions and persons as they think fit, within the bounds of the law of nature, without asking leave, or depending upon the will of any other man. A state also of equality, wherein all the power and jurisdiction is reciprocal, no one having more than another." David Hume divided "the perceptions of the human mind" into two: impressions and ideas. An important point that he was making is that, when you see something, the impression that it makes on your mind is not the same as the idea you have of it. If it was, you would be able to see oranges, but not to think about them when they are not there. Hume, an empiricist, argued that ideas are just "the faint images of impressions" that we use for thinking and reasoning. rationalists argue that some ideas exist before impressions, they are a priori. Thus, when we look at things, we arrange them on a map of "space" that is already present in our heads. Julie Ford asserts that "Induction is simply codswallop". A few pages later she says that a scientist who believes she has discovered a truth by means of induction has merely linked observations together and then invented a fairy tale to explain them. As she says "the most common type of inductive speculation in the social sciences is that which takes a statistical form". ( Ford, J. 1975 pages 136-139). By following this link you can read my explanation of what induction is. I will leave you to decide if it is codswallop. Logic: Logic is reasoning by a progression or sequence of statements, each of which must be true if the statement before it is true. An argument is logical when each step follows from the one before. In a more formal sense, Deductive logic is about ensuring your conclusions follow from your premises. The whole aim of logic is to do away with the possibility of deriving false conclusions from true premises. It does not aim to protect us from deriving false conclusions from false premises. Logic guarantees that if your premises are true, and you use valid procedures, your conclusions will be true. A syllogism deduces a conclusion from two propositions called the premises, which contain a common or middle term (men/man in the above example) that is absent from the conclusion (e.g. All As are Bs, all Bs are Cs, therefore all As are Cs). Syllogizing is reasoning from general statements to particulars, using the form of the syllogism. Metaphysics is the branch of philosophy that deals with first principles and seeks to explain the nature of being or reality (ontology) and of the origin or structure of the world (cosmology); it is closely associated with theory of knowledge (epistemology). Karl Popper calls metaphysics "faith in ideas of a purely speculative kind". One definition of speculate is to engage in reflection or conjecture to form a theory without a firm factual basis. In other words, to exercise one's imagination. metaphysics means after physics. It relates to the order of Aristotle's books. onto means being. Ontological can mean relating to ontology. When Ronald Laing writes about ontological security, however, he means security in one's being. An opinion is something we think or believe. On its own, it is our personal opinion. Shared with others it is a common opinion. Shared with enough people, it is a public opinion. But are opinions true? In different ways, opinion is put to the test. We carry out trials of the truth of our opinions. A paradigm is something that sets an example, or pattern, for other things. A metatheory is a theory of first principles. (See metaphysics) "Meta" means it is a theory of a higher order or more fundamental kind than other theories. One of Kuhn's examples of a paradigm is Copernican astronomy, the theory that the planets revolve round the sun. He contrasts this Ptolemaic astronomy, the theory that the sun, the planets and the stars, all revolve round the earth. Other examples are Newtonian dynamics and wave optics. Each of these paradigms led to centuries of scientific research. A paradigm includes the general theory (metatheory) of the scientific tradition and its practices. Practices include the accepted ways of carrying out research. The word metatheory was used by Julie Ford to refer to the theoretical part of paradigms. An important feature of metatheories is that they are not empirically testable. They are "immune from the risks of testing" ( Ford, J. 1975 p.106). A great deal of important theory, in the natural and social sciences, is not directly usable for empirical research. That is, it is not even potentially testable by experience. These are the "big theories" that underlie the approach of a whole scientific tradition. These big theories can generate smaller theories that are (potentially testable), but this is not a test of the big theory, because it is possible to generate other testable theories from them. This is why Ptolemaic astronomy did not collapse when some testable theories it generated failed, and why Copernican astronomy survived, even though some testable theories it generated failed. Different authors have given different names to these "big theories". They have been called paradigms, metatheories, schools of theory and theory groups. As examples, from social science, I would suggest: utilitarian theory, Marxism, behaviourist psychology, psychoanalysis, symbolic interactionism, Durkheimian sociology, Weberian sociology and structural functionalism. Most of the theory studied on courses that deal with classical social theory, is metatheory (theory of first principles). Developing potentially testable theory, from metatheory, is a major activity of the different subjects that use the metatheories. Positivism is trying to understand or describe the world as a sequence of cause and effect between objects that one can observe. Seeking to understand the world as it is, scientifically, rather than criticising it. Some people confuse positivism with empiricism. This confusion may be because the logical positivists are empiricists. The French theorists who first used the word positivism were not empiricists.  Can mean testing a theory by showing that one point follows rationally from another (as in geometry ).  Can mean testing a theory by showing that its premises ( axioms ) and/or conclusions conform with empirical reality.  that there is no other rational theory which also fits the empirical reality. To fully prove a theory to this extent is either very difficult (Mill thought Newton had done it); or impossible ( Einstein demonstrated that Newton had not done it, and there may always be a theory, waiting for someone to imagine it, which is better than the accepted one). Kant, following Descartes, argued that there are some things we can only discover by reason, not by empirical investigation. The conception (or judgment) "I think" is one such. It is the basis of all our other conceptions, including our conceptions of empirical realities. But it is not something we discover empirically, we deduce it, rationally, as the precondition of our thinking anything. Descartes argued that reason, not empirical experience, is the foundation of knowledge. Our empirical experiences delude us. Seeing should not be believing, because we see things differently in different lights and in different states of consciousness. An orange is a different colour (orange) in daylight than it is in darkness (black). To gain knowledge we have to doubt the empirical appearances, to reach the truth. The only thing that (logically) we cannot doubt is that we are thinking. That is the basis of the whole exercise. From this basis we have a secure foundation to reason other things. The first step in Descartes' reasoning is if I am thinking, I must exist. Descartes wrote this in Latin: Cogito, ergo sum. In English it means I think, therefore I am. "Whether we are awake or asleep, we should never be persuaded except on the evidence of our reason..., and not of our imagination or our senses. For, although we see the sun very clearly, we should not on that account judge that it is only as large as we see it" (Descartes/Penguin 1968 p.59). The rules of reason are called logic. If you state a case rationally you will connect ideas consciously and clearly. Your writing will have a clear purpose and you will state your thinking in a logical form. As the reader goes from one point to the next, he or she will understand the connections and see where they lead. The idea of reason has been a subject for debate since at least the time of the ancient greeks. The meaning that authors give to the term differs, and students should try to understand the meaning of a particular author from the way he or she uses the term and how it is related to other terms in the author's writing. What follows is my explanation of reason, and why it is such an important issue. Reason is something which lets you get results from mind: It enables you to anticipate. Some things we know empirically, through experience, other things we work out by reason. You may empirically know someone called Jones who lives at 40 Somewhere Street, but not anyone else in the street. However, if you are told that Jenny Smith lives at 35 Somewhere Street, you may reason that she lives near Jones, but on the opposite side of the street. that the houses in it are numbered in order but with odd numbers on one side and even numbers on the other. If your premises are correct, and your reasoning correct, your conclusion should be correct. Reason is one path to knowledge, experience is another, but they interrelate. As a student, part of your task is to work out how. From the axioms and conceptions a theorist uses you should be able to anticipate what a theorist will think about a subject. For example, from the utilitarian claim that "good" is what avoids pain and maximizes pleasure you might be able to work out what kind of laws they think are bad and what kind of laws they think are good. You may get it wrong, but the fact that you and they are both using reason will mean that you will often get it roughly right. It is thinking through the argument of theorists, in this way, that will teach you what theory construction is and set you on the path for making your own theories. The reasoning in an essay is the argument set out in the body of the essay to maintain the case that the essay makes. To explain an author's reasoning is to show, from what the author writes, the reasons for the author's conclusions. Doing this is a necessary part of a critical evaluation of the author. Reflection is a synonym for thought. It is particularly used for turning one's mind back on a subject and thinking seriously about it. In Kolb's learning cycle it is the stage when you think about what you have done and try to develop new concepts to deal with the problems. The image of looking at oneself in a mirror, suggested by the word, means that it has implications of being conscious of what one is doing. It is related, therefore, to autonomy. Because of this, it is used a lot in some study guides. Derek Rowntree (1988), for example, praises the "reflective student" who thinks about her own experience of studying and decides what changes of approach might best suit her (p.viii). Rowntree says reflection is studying one's own study methods as seriously as one studies the subject (p.8) and thinking about a learning task after you have done it. Unless you do this, he says, the task will almost certainly be wasted (p.94). In any learning situation, he says, you should "prepare for it beforehand, participate actively during it, and reflect on it afterwards" (p.122). He applies these points to working in small groups, suggesting note taking in the group as an aid to reflection afterwards, and also suggesting reflection on how the group operates (pp 124-125).  Reflection and Kolb's learning cycle are discussed in the Autonomous Learning part of this web site. The "re" in research means intensive. The basic meaning of research is careful, thorough investigation. Three special meanings you will come across are when people speak of a "research stage" before a "writing stage" - library research, and when research refers to empirical research.  research as advanced study: Post graduate students "do research", whilst undergraduates just "study". In this sense, research means study to a greater depth, and with more self-direction. Some post graduate courses are taught like undergraduate courses, (but at a higher level). Such a course could be a "taught Masters degree". Those postgraduates who do research degrees eventually write a "thesis".  research before writing: Some people divide essay writing into two (or more) stages in which "research" comes before "writing". Here research mainly refers to investigating the subject by reading books about it. Students are advised to "plan your research" and "start your reading and writing" many weeks before an essay is due. The research stage on a dissertation may begin a year before it is submitted. The parts of an essay title or question, or the terms used in describing the dissertation, provide tentative headings for the research. Nowadays, much of the initial research will be carried out on the internet or using computer catalogues/indexes in libraries. Using the initial headings as keywords, the researcher identifies relevant books, journals and other materials to use. But research can also be intensively focused on just one or a few books read in depth. Researching an essay that asks you to "Discuss the relation between reason, gender, the family and politics in the work of Rousseau with special reference to Emile" might mean buying a cheap paperback copy of Emile, carry it around in your pocket, and research it in depth whenever you can. Your own copy can be marked - which you should never do with library books. Library research is the kind of research you can conveniently carry out in a library. It is also used as a term for secondary, as distinct from primary research. The term desktop research is also now being used. This may refer in part to the way research can be carried out, over the internet for example, through desktop computers, at home or elsewhere, but it also includes the research that one carries out with the books and other printed materials on one's desk. "Research is defined as a process of investigation leading to new insights, effectively shared in a medium appropriate to the subject. It includes work of direct relevance to the needs of commerce, industry, and to the public and voluntary sectors; scholarship; the invention and generation of ideas, images, performances, artefacts including design, where these lead to new or substantially improved insights; and the use of existing knowledge in experimental development to produce new or substantially improved materials, devices, products and processes, including design and construction. It includes research that is published, disseminated or made publicly available in the form of assessable research outputs, whether written (books, journal articles etc), presented, performed, exhibited or in other form appropriate to the discipline. It excludes routine testing and routine analysis of materials, components and processes such as for the maintenance of national standards, as distinct from the development of new analytical techniques. It also excludes the development of teaching materials that do not embody original research." To review something is to make a survey of it. Sometimes you revisit what you have already done, as when you review what you learnt from reading part of a book. Sometimes you just take stock, as when you review your resources before writing an essay. Often you evaluate what you review, and sometimes you will improve it as you do so. An example of this is when you review your notes and clarify their meaning. Evaluation is usually involved as well when you review a book (or some other production) by writing a report on it.  There are examples of all these uses of the word in the Notes and Essays part of the printed Study Guide. A philosopher who is inclined to doubt the possibility of real knowledge is called a sceptic. David Hume (1711-1776) was a sceptic. Although he agreed with Locke that science makes sure that our ideas relate accurately to objects in the real world, he thought that when we try to do this we do not get far. Science is very limited and reason, on which we try to build it, is a slave to our passions. Habit and custom are what hold our ideas together, and matching our ideas to the real world is a lot harder than we first thought and, in most areas, probably impossible. Things are in sequence if they follow one another in order. Thought is sequential if its parts follow one another in a logical order. If an essay is sequential, it may be said to "flow". Hobbes thought that all thought is sequential. Some he thought rambled without an object, whilst other thought had an end or objective. The idea of spidergrams may suggest that thought is much more untidy than Hobbes imagined, and needs to be organised to make it sequential. Hobbes called the sequence of items in thought a train of thought. We might also say a chain of thought. When we are explaining something to another person (or to ourselves) all the links between the items of thought need to be made. We need to understand and show how thought moves from one point to another. Can just mean having doubts about something, or can mean the philosophy of sceptics that real knowledge is unobtainable. Test - The following definitions are based on The Plain English Dictionary and cover most of the meanings of this word. "When you test something, you try to see what it is, what condition it is in, or how well it works. A test is a deliberate action or experiment to find out whether something works or how well it works. If a theory (explanation) is testable, it can be tested to see if it works or is true. Not all theories are testable. However many scientific theories and everyday explanations can provide hypotheses which we can test in different ways. We may have to do quite a lot of work on a theory to develop a testable hypothesis from it. If you test someone, you ask them questions to ask them how much they know about something. A test, in this context, is a set of questions or tasks given to someone to find out what they know or can do. Theory: theories: Read Social Science History: Six essays for budding theorists chapter one. Sets of ideas that we use to explain the world are called theories. Theories are composed of relationships between concepts. The word theory comes from a Greek word for observing. We use theory to look at the world. You may think that looking at the world is a simple matter of using your eyes (See empirical), but we use theories to organise and understand what enters our minds through our senses. William James, an American psychologist, called the way we look at the world through theory, apperception. Apperception means to interpret new impressions and ideas in the light of ones we already have. This, he said, is "the way that we receive things into our minds" ( James, W. 1899 p.77). You are using theories all the time. Here, for example, is the way a theory about who you are can get you out of bed. When you wake from sleep you are unlikely to lie in bed wondering who you are. Instead, you immediately bring into use a set of ideas you already have about yourself. If you are woken up by a baby crying your perception will be different if you think you are the baby's parent, than if you think you live next door to the baby. Reality may persuade you that your theory about yourself is wrong, but you do not wait for reality, you start with theories. It is the same whether we are dealing with the everyday concerns of nappy changing as it is when we are trying to understand the world 'scientifically'. To look at the world we use theories, and the world will appear different to you according to the theory you use. Theories are something you use all the time. But there are differences between the types of theory you use to get up in the morning and the theories that Newton used to explain how the sun gets up in the morning. paradigms and metatheories (which are not testable). Theories are composed of relationships between concepts. The type of theory most directly relevant to empirical scientific research is composed of propositions arranged in a deductive system to provide an explanation. A formal example of this is the deductive-nomological explanation). Testable scientific theories may be derived from paradigms and metatheories or from apperceptions and common sense theories. has a special meaning in relation to social science. The early English thought that really knowing what we are talking about is like standing beneath it. Perhaps they were thinking of a person who can carry a burden on his or her shoulders. If we understand people, we have a sympathetic awareness of what it is to be them. If we understand ideas, we see their meaning. If we understand a subject, we have control of it and are able to do things with it. When writing essays, you need to understand the issues and to show that you understand them. Using clear (plain) language is a part of this. But the books you are reading may not be in plain language. Even if they are, you may find them difficult to understand. You will not demonstrate your understanding unless you can explain the ideas in your own words. The advice about reading difficult books may help. You should also read the tips for making your writing clearer. This explains how you can make your understanding clearer by combining quotations from books with your explanation of what they mean. Understanding is the difference between deep learning and surface learning. But how do we get there? How do we manage to stand underneath a subject? I think the first thing is to want to understand. The next is to be willing to admit that you do not understand. And the next is to be willing to ask questions. But there is more to understanding than having something explained to you well. You need to reflect on what you have been studying and then, in some way, you need to do it yourself. This quotation from a student may show you what I mean. "Normally, I read the material first and then give my brain a rest for a few days to take in what I have read. I will then write the ideas down from brain storming. I normally do this by jotting points down in the order I would want to write an essay." In recalling what she has read, the student says she is recovering the "ideas". She is not recalling the words that were used, but the ideas that the words conveyed. I suspect that her mind was not so much resting as thinking about the issues. We can understand what we read to different levels. The further beneath the surface of the writing we swim, the more we understand the axioms of the writer's thought, and the more able we are to make a critical evaluation.